My buddy, Brad Lum of Illumine Art Pottery down in San Antonio, stopped by St. Louis for a visit. 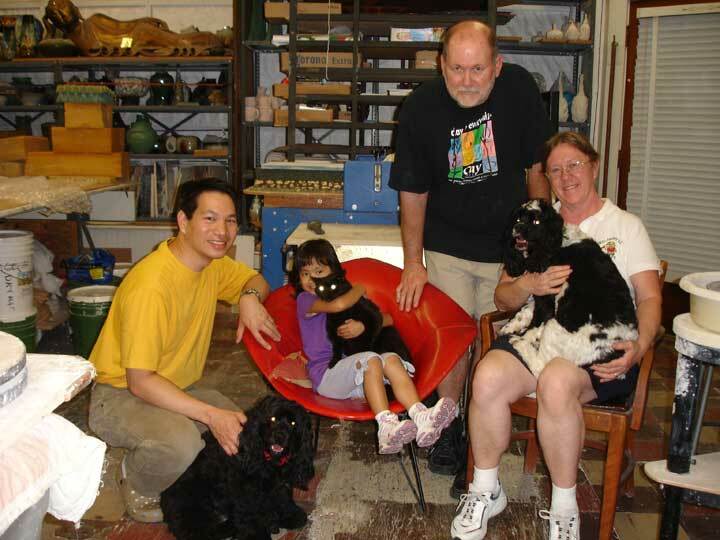 I had not seen him since 2005 up in Zanesville when he did Pottery Lovers. Lately I have been involved a bit in Scouts. In fact this Sunday, I go to summer camp for a week with 45 kids and another adults. It is great fun. I made up a custom pop corn popper for use over camp fires. A couple of years ago I bought a camp fire popper, but it was useless. It was made of thin steel and the corn would ALWAYS burn. I made a heavy duty popper out of an 8 quart Farberware pot- buzzed three 1" bar aluminum legs on it and made a special handle. To use it, you just drag a layer of coals out of the fire and set the pot above it. I works flawlessly. I still have to hinge the lid. Of course none of the kids used sun protection!!! 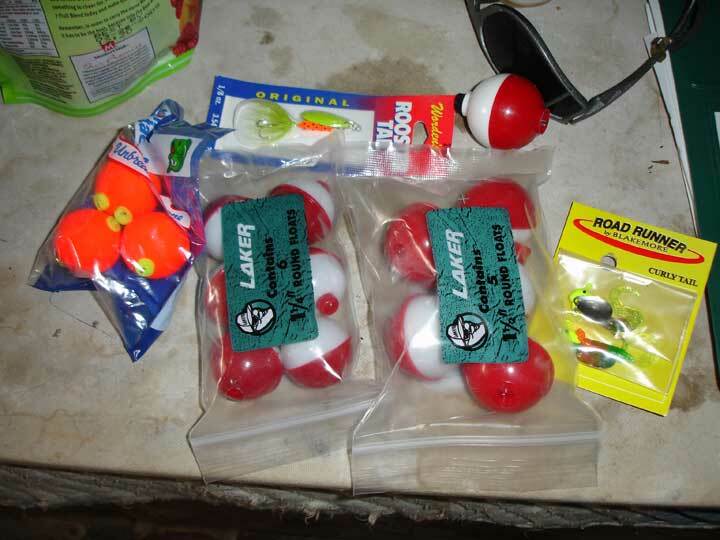 I am the fishing merit badge conseuler and have been stocking up on fishing stuff for summer camp. The kids burn through bait and gear. 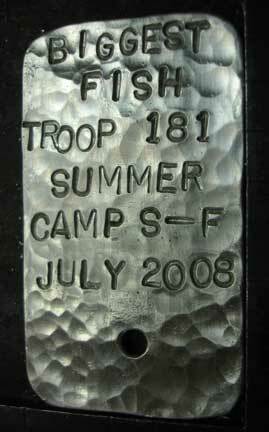 Just to make summer camp memorable, I made three medals out of pure silver that the kids can earn. One is pictured in the following two photos. I intend to do an Ahab number and nail the medals to the post that support the camp shelter. The kids will have a week to dream of possessing them. The second medal (not finished yet) is titled "Most merit badges earned" and the third (unfinished as well) is "Most special object of nature found." You will see the results on my next update. Nice engraving yes? 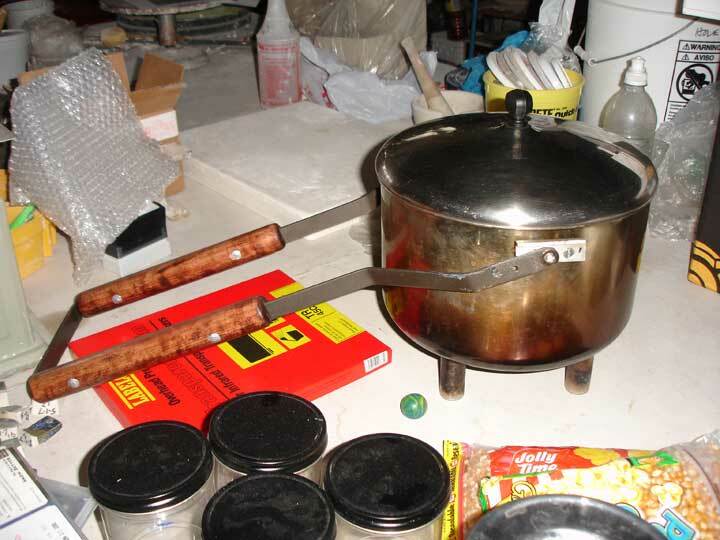 Ok, you visit here to see pots right? I'll show you a few of the things I have been making. I have not been terribly productive and have been making things that tend to sell well and at lower prices. I have always been a collector of space memorabilia. I have a lot of Apollo 11 stuff and was there for the lift-off in'69. I have signatures, photos, newspapers, medals, pottery, pins, passes- all kinds of things. Recently, I had a number of photographs taken during space missions printed for my by the Media Resourse Center at the Johnson Space center. I am on a mission to get those photos signed by the pictured astronauts. Most of you know that I make a line of pots that I call "history pots." Click here to see some of them way down on the bottom of the page. Anyway, I am making a number of give-away space sculptures that I can give to people that help me with my mission. Pictured below is what will be labeled "God bless John Glenn- again!, STS-95 10-29-98". I am also making a few sculptures of scenes on the moon. If you are interested in pieces like this, let me know, I can always make one more and I can always use the $. 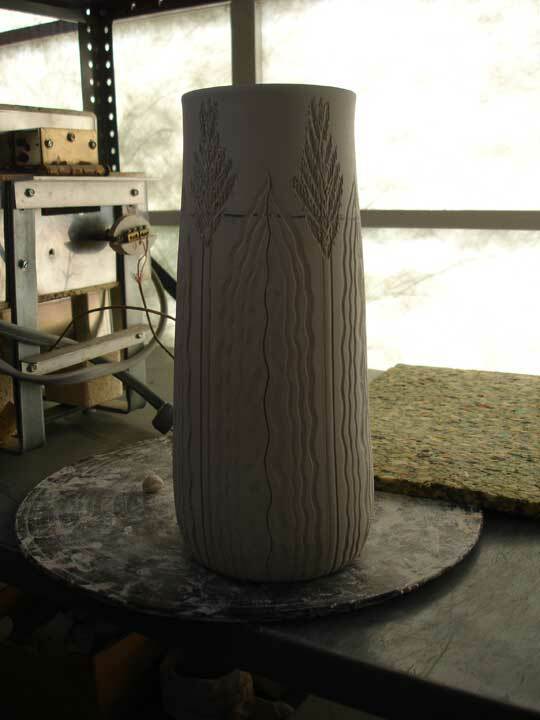 A stylized plant form vase. 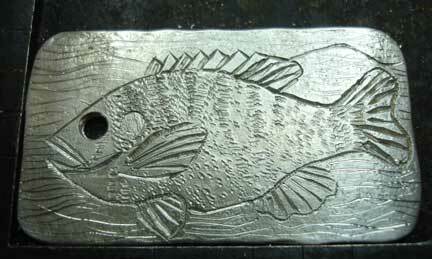 Don Treadway sold one recently at a dramatic price so I am making a few more!! 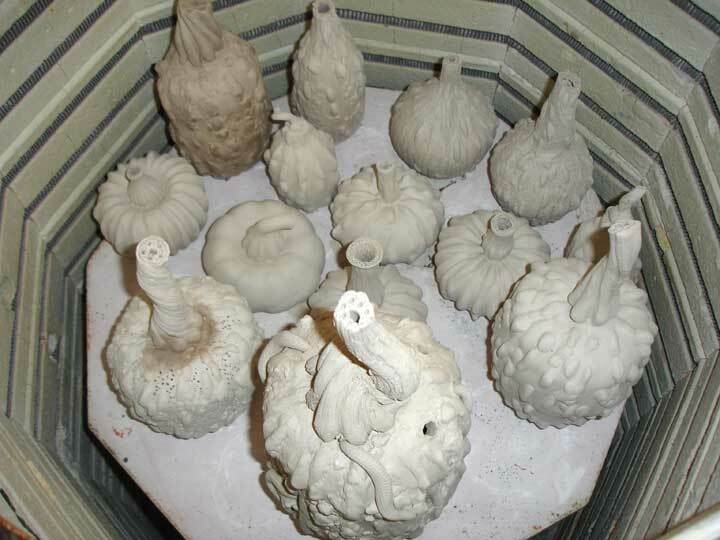 I am making a lot of gourd pots. It seems that I am always out of them, so I am making a bunch! These pots- best displayed in the kitchen- always sell. This is a big one and was modified after this photo. I changed it by turning it into something else that I told myself I would not do anymore. I am weak and cave to my desires whether it will earn a dollar or not! I'll show you a picture of it in a future update. I have two women that will be pleased with this photo. Lundi and Ann, it won't be long now. 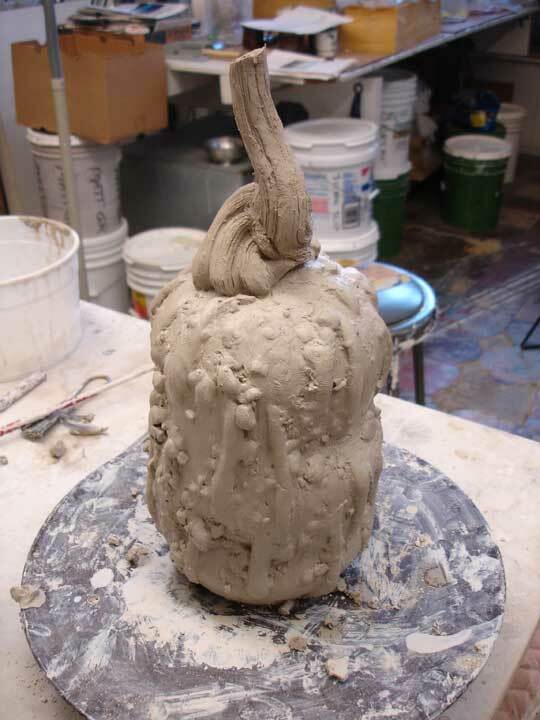 Patience, ceramics is a slow, slow art form. I am always waiting.... Waiting for clay to dry, kilns to heat up, kilns to cool down, waiting for a cash flow.